It's going to be a loooooong night!!! My father in law is in the hospital and my husband is with him. The kids are sleeping so I am taking advantage of this quiet time!!! Finished some of the Kerri Bradford 8 x 8 Storyboards for my December Daily and I wanted to share some pictures from tonight. I really wanted to capture our Christmas tree in the background. I love the way they turned out. 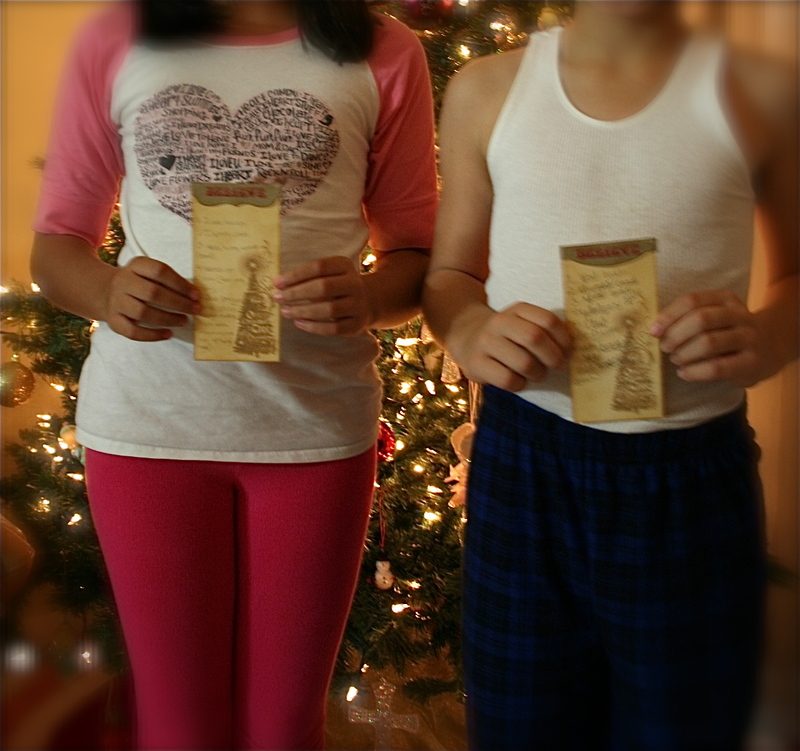 their letters to Santa in front of the Christmas Tree. Thanks my hero!!! I am truly loving the process of my December Daily. This Friday I will catch up with all my journaling and a couple layouts I have to complete for it but other than that, it's coming along nicely. Hope you all have a wonderful week & weekend....see you all on Monday!! Oh my dear Teri this is such a sweet post. I love the pictures, my fav is the one of the kids holding their tag list, great idea. Yes, the Christmas tree in the back is just beautiful. Have fun with your daily and enjoy your family, that's what life is ALL about. Hello! It's been ages since I commented on your blog! I'd like you to stop by my blog and check out the post I just put up for 12/12 I think you will like what you see there. Maybe you'll remember me, maybe not, but please do stop by and view this post. My addy is kristiekreates.blogspot.com and let me know what you think!